Unofficial desktop client for Soundcloud. 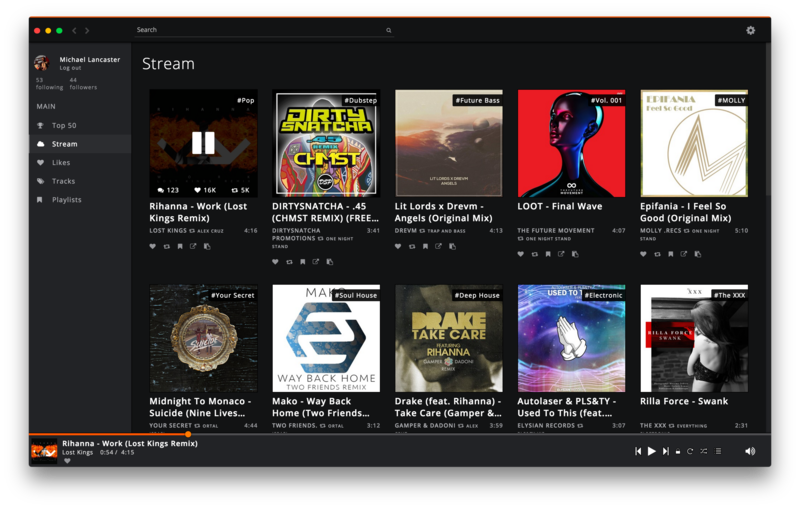 Soundnode App is an Open-Source project to support Soundcloud for desktop Mac, Windows, and Linux. It&apos;s built with Electron, Node.js, Angular.js, and uses the Soundcloud API. Be aware that Soundnode relies on Soundcloud API which only allows third party apps to play 15 thousand tracks daily. When the rate limit is reached all users are blocked from playing/streaming tracks. The stream will be re-enable one day after (at the same time) streams were blocked. Follow us on twitter for updates @Soundnodeapp. Since soundcloud apply rate limit to third party app you need to configure your own API key to make soundnode work. Unfortunatly soundcloud suspended new application creation, so to retrieve your api key, you have to dig into soundcloud website. Edit your userConfig.json file (see here for location : https://github.com/eliecharra/soundnode-app/blob/master/app/public/js/common/configLocation.js#L34) and update clientId parameter with the previously retrieved one. First, building, testing, and reporting bugs is highly appreciated. Please include console&apos;s output and steps to reproduce the problem in your bug report if possible. If you want to develop, you can look at the issues, especially the bugs and then fix them. Here&apos;s a list of issues. Please follow the contribution guidelines. See the Development page for a complete guide on how to build the app locally on your computer. Thanks to all contributors that are helping or helped making Soundnode better. GNU GENERAL PUBLIC LICENSE Version 3, 29 June 2007 license.